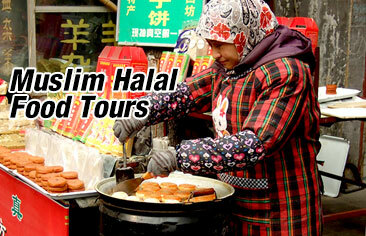 Chow down on some of the best Halal foods in Shanghai where you can find a variety of cuisines. Some of the best Halal restaurants in the city include Hong Chang Xing, Oriental Yakexi, Guan Guan Ji, Xiyu Diyipan, Aladdin Halal Restaurant and many more. These restaurants serve a variety of cuisines such as authentic Chinese, Uighur and Indian. Hong Chang Xing has been around for more than 100 years and is one of the oldest Halal restaurant in Shanghai. The restaurant is known synonymous with its signature mutton and beef hotpot. It's hotpot soup base are unlike other hotpots. Hong Chang Xing’s hot pot is not oily as it is made with plain water and seasoned with herbs, vegetables and meat. Signature dishes include Mutton for Hot Pot, Scallion Cake, Lamp Dumpling, Braised Oxtail, Beef Noodles, Lamb Back Ribs. Private rooms are available for hosting family events such as weddings or birthday parties. The restaurant also has a pastry section, deli, and a selection of take away snacks. Oriental Yakexi Restaurant is known for its authentic northwestern Xinjiang dishes. The ingredients used to prepare their mouthwatering dishes are freshly air-flown from Xinjiang. Mutton Kebabs and Big Plate Chicken are the must try dishes of this restaurant. For those who love mutton, the Naan and roasted lamb chops are a treat for your tastebuds. The traditional authentic yoghurt is great as an appetizer. Address: No. 379, Xikang Road, Jingan District, Shanghai. Located on the bustling Zhejiang Road, this restaurants serves traditional northwestern Chinese cuisine and is considered as one of Shanghai's best Xinjiang restaurant. It serves mouth-watering, openly displayed array of foods like BBQ Lamb Legs and Rib Racks, Boiled Lamb, Chicken, Baozi, Hotpot, Yoghurt and lots more. The restaurant's workers wears Muslim attire such as the men wear Muslim white caps, and women wear pink headscarves. The restaurant also enforces a strict no smoking and drinking policy. Address: 70 Zhejiang Zhong Lu, near Beihai Lu, Shanghai. Aladdin Halal Restaurant is a famous Halal restaurant in Shanghai that specializes in authentic Indian food. It is quite popular among customers for its delicious Roasted Sheep Leg and Shashlik, Curry Lamb, Chicken, and Fish Tikka, and Aladdin Yogurt. Delicious Xinjiang dishes are also served here such as the Xinjiang Cold Noodle. Mango lassi is one the most popular beverage in the restaurant . Vegetarian dishes are also available. Address: 1st floor of Karamay Hotel, No. 21 on West Jiaotong Road, Putuo District, Shanghai. Gulixian Xiyuqing Restaurant is another Xinjiang restaurant in the city of Shanghai. Traditional classic Halal foods that are popular amongst its customers are its Big Plate Chicken and Mutton Kebabs. Another popular dish among its customers is the French-style Lamb Steak, which is slightly less traditional. Other must try dishes include Braised Sea Bass with Wild Mushrooms and Mutton Rolled with Pancakes. Also, do not miss out on their the special milk tea and yoghurt. Address: No.295 Tacheng Road, Shanghai. Also another not to be missed Uighur restaurant serving very good Halal food is A Fan Ti restaurant. There is Uygur music and dance performance every night. Their signature dishes are the Shashliks, Grilled Mutton Chop, Mutton Rice, Dapan Chicken and Stir-Fried Nang. They also serve Roasted Whole Sheep that can easily serve more than 10 people. Address: B1 Floor, Tianshan Hotel, No. 775, Quyang Road, Hongkou District, Shanghai.